"You're all right. Come on, take my hand. There you go. Let's get you up." The world was still spinning on strange axes. Olaer couldn't see well enough to find his bearings. Colony lights were dim at this hour, to keep the inhabitants sedate. It hadn't worked. Someone had helped him to his feet and now had their hands wrapped around his shoulders. "Can you stand?" the person said. It was a young voice. Olaer, who was not young, nodded and set his feet. He felt the hand lift gently off him. "Thank you," he said. He swayed a little, but remained upright. "What is your name?" "Yane," the young voice said. Olaer turned to look, and focused as hard as he could. His guardian was a Thukker, like himself. Olaer could not remember seeing him on the space colony, but in Thukker places this was perfectly normal. Their people were travelers. They were in the Great Wildlands, home of the Thukker Tribe and current sanctuary for those Starkmanir and Nefantars who had fled or been freed from Ammatar and were waiting to be let into the Minmatar Republic proper. In the meantime, the refugees waited here, guests in the place Olaer called home, and when they had nothing to do they found something to do. There had been three of them, and they had not been happy to hear what Olaer had to say. He took a step, tumbled, and nearly fell on his face. Yane's hands grabbed his shoulder again and pulled him gently upright. "Alright," Yane said. "enough of that. Do you live nearby?" "My name ... my name is Olaer," he replied. It felt important he establish this. "Not that close," Olaer said. It wasn't too far off, either, but in his current state he doubted he could even cross the street unaided, let alone get home without collapsing from exhaustion. He did not intend to have anyone carry him there. He was not that old yet. "Then we're going to my place so you can catch your breath," Yane said. "I live right over there." He pointed towards a window on the other side of the street. "Lucky that I heard the trouble. People don't help others out much, in this place." "No, they don't," Olaer said with regret. "So what happened?" Yane said. Olaer gently rubbed his side and gingerly stretched his feet. He was sitting in the apartment's only chair. The adrenaline cloud had evaporated, giving way to piercing rays of pain from his battered body. "I told them who they were," Olaer said. He looked around. The apartment was dark and bare. It was all one room, lit with a single bulb in the ceiling, with no internal walls and no apparent source of entertainment except for a bunch of metallic-looking blocks in one corner. Beside his chair there was a desk, a metal alloy like everything else on the colony, and on the desk there was an old-model datapad good for little more than reading and touch-screen writing. There wasn't much here to evince a personality, good or bad. But the man had saved him. "And who were they?" Yane said. He was young, probably in his late twenties, and looked extremely strong. He carried himself like a man wearing heavy armor. Olaer decided to take the plunge. "Traitors. Traitors and leeches." Yane raised his eyebrows . "Did you say that to them?" he asked with a wide grin. "No wonder they beat you." Olaer waved his hand, "No, no. Not like that, at least. They were being loud and obnoxious, and I was doing my nightly walk in the fresh air. Their behavior so annoyed me that I told them they'd be better off doing an honest day's work than keeping people up on the colony. So they crossed the street and, well, I had a moment to regret my old mouth shooting off one last time." "Thukkers who are moving to the Republic lands. Settling," he spat the word, "and finding some stability, whatever that means in the Thukker head. The Starkies and Nefs, I'll grant, had little choice but to come here, even if I wish they'd have retained enough of their dirty slave roots to help us with our business. But I've no patience for a Thukker who doesn't want to be one. I hope I haven't offended you, in case you're moving as well," he said, leaning back in his chair and gently rubbing his hands. "I've had my share of beatings for the night." Yane grinned. "It's fine. This ain't much of a home, as you can tell. I'm a crewman on a Thukker ship, and I spend most of my time out in space. I ain't settling anywhere. Besides," he added, "I've kept an eye on the new guys, and I don't like them. At all." The old man, relieved, said, "I agree. And I generally tend to like people. I don't mind these guys for who they are or what they've done, and I'd never say no to someone's second chance. But you've got to make something of it. Not just run, then expect someone else to solve all your problems." "Didn't used to be like this, I guess," Yane said. "No, it didn't. People knew who they were and what they were capable of, and even the most rootless of meatheads in the Tribe had enough sense to act like real men, and enough strength to be criticized without turning into monsters." "The Thukkers that moved to Republic lands, they've gotten soft and weak," Yane said, and Olaer wasn't sure which of them was echoing the other's thoughts. "Nefantars are either arrogant or kissassy, and the Starkmanirs are just ... well, they're simply stupid. You try to talk to them and all you see in their eyes is your own reflection, staring back at you." The old man said, "And I don't like talking about people like that-" He sent a stern look to Yane, who had the decency to look away, "-But sometimes you can generalize. These poor people haven't been properly integrated. And they should be sensible enough to keep their mouths shut, their eyes open and their hands in their pockets until they learn the new ways. Your past should strengthen you, not be an anchor or a cloak." Yane nodded. "Did you know the Amarrians, even though they ban full-body cloning, permit you to be regrown? That's weakness. That Aritcio guy they cut up, he's now back in the game, all nice and pretty. They should've let him be like he was at the end. Shredded. Let it strengthen him. They shouldn't have rebuilt him the way he did." "You think he would be the same as he is now, if they had?" Olaer asked. "I think he'd be honest, to himself and others. And he'd have an image that would keep people on their toes. You don't say no to the scars." Something in his voice raised a flag in Olaer's mind, but he left it for the time being. He looked around and said, "Looks like a typical Thukker apartment. You don't have any problems saying no, I can see. What're those metal things in the corner?" Yane laughed. "I'm not here very often, and they're weights. There's magnetism in them, or something like that, so you can put them together or take them apart." He demonstrated, taking two metal blocks and holding them up to one another. They grabbed on with a clang. Yane let go with one hand, letting the blocks hang perpendicular from the other. He grabbed hold again, twisted the blocks slightly, and they detached. "Simple, clean and definite," Olaer said. "Damn straight," Yane said. "When I'm here, I weightlift as much as I can, often to the point where I can't even hold my pen." "So you write as well?" "When my hands stop shaking, yeah," Yane said with a shyish grin. He walked over to the desk and picked up the pen and pad, then started slowly pacing the room, scribbling aimlessly on its surface. "I like to keep them in use. Keep moving." "Do you write a lot?" Olaer said. It felt important, though he couldn't say why. "Yeah, actually I do. About anything, really. And we agree on the immigrants, by the way," he added. "I don't mean to be insulting when I talk about them, and I definitely don't hate my own people. But I think you and I, we agree. We're approaching the same destination, maybe just from opposite directions." Olaer looked at him and at the pen in his hands. "What do you see?" Yane asked. He came to a stop by the weight blocks. "I should be seeing the weightlifting, because it fits you. That pen should stick out like an eyesore in this barren image of power you project. If I were a foolish man who did not pay attention to my surroundings and the people around me - like I believe some of the new arrivals do, though not all of them by far - I would think it strange that someone who clearly lives for the strength, and projects this kind of image, would be writing at all." He stood up, grateful that his legs didn't complain, and walked over to Yane. "But I don't find it strange. Because you're the opposite. You're a thinking man clad in an exterior of strength and an aura of bullishness. Why?" Yane gave him a strange, long look. He walked back to the desk and put away the datapad, then rested his hands on the back of the chair, his back to Olaer. He sighed. "My family travelled," he said. "Sometimes for business, and sometimes to escape trouble. 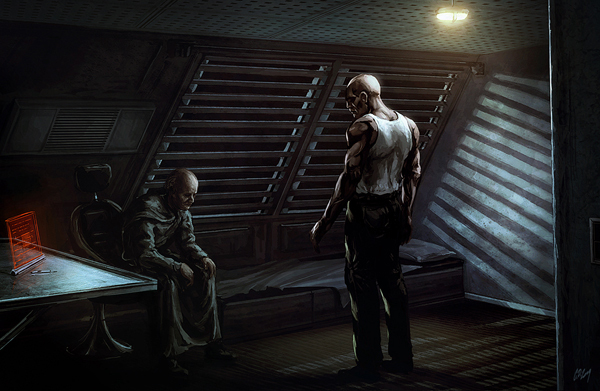 One trip, we were on the run and only found port in a dark colony that catered to bad people. It was hard times and we had to make our stay there, no matter who else was in that place. You know how much politics matters when you're a kid in a strange place? Nothing." He turned to face Olaer, and said in a voice overlaid with glass strength, "And I met this Amarr girl. She was with her own family of missionary businessmen. We were ten. Stupid puppy love." He reached out without looking and picked up the pen from the datapad, hefted it in his hand like a spear. "And then my parents found out. They and everyone else. Like I said, it was dark times." Olaer's mouth felt dry. "What did they do to you?" In a voice that sounded like he was talking as much to himself as anyone in the room, Yane said, "I am going to show you something I have not shown to many." He took off his shirt and turned. The single light reflected off the destroyed skin on his back. The scars ran so deep it was as if they had penetrated to the bone. In the glare they reminded Olaer of ridges in a valley of fire; like lines on the eye of the sun, brighter than bright. "What happened to you?" he whispered. "I was rebuilt. The Thukker way." Olaer had to lean against a wall. For a while there was silence in the room, and the old man listened hard for the quiet noise of the night outside, if only to remind himself that civilization still existed. "What do you write?" he said at last. Yane nodded, as if the old man had confirmed something. "Whatever I need to get out of my head," he answered. Olaer took a breath, thought for a moment, then ambled over to the weights. He ran his finger over one of the blocks. It was cold, and its scratches and discoloration spoke of heavy use. "When you're not saving defenseless people from the attentions of the mob." "Have you risen above your past, you think?" "Yes." The word came out like a whip. "You mentioned Aritcio. You clearly keep an eye on him." "I pay attention to politics," Yane said. "What are the five houses of Amarr?" "Ardishapur, Kor-Azor, Sarum obviously, Tash-Murkon and Kador." "What was the name of the assassinated second-in-command of the Caldari State?" Olaer nodded, and hobbled back to the chair. His legs really were starting to hurt. He sat down and rubbed his shins. "Your attentions are quite focused, young man," he said. "Narrowly, even." He took a deep breath. "Sounds to me like you haven't entirely let go." The light reflected off the young man's scars. Olaer realized he hadn't witnessed what happened to the assailants. He had heard someone intervene, under the beatings and his rapidly fading consciousness, and when he awoke they were all gone. It seemed like it should matter. "I don't know what you're thinking, but you're wrong," Yane said in a dead tone. "I think you're very lonely," Olaer said. He got up to his feet and made his way over to Yane. He raised his hand to lay it on the young man's shoulder, but Yane said, "Don't," without meeting his gaze. Olaer sighed and walked away, slowly and carefully, out the door and into the night.